Football is a game of two sides. Whether you fancy yourself as an explosive winger, lethal finisher or a gladiatorial defender, every time you step onto the pitch you make a string of choices that define the type of footballer you’re going to be. You might line up against the opposition dreaming of putting on an individual show or a tactical masterclass. You might choose silky skills and mad tekkers over pinpoint accuracy. Hell, you’ve even got to decide how you want to celebrate your goals. But whatever your style of play and which decisions you make on the pitch, you’re eventually going to fall on one side of the fence and realise what kind of football player you really are. 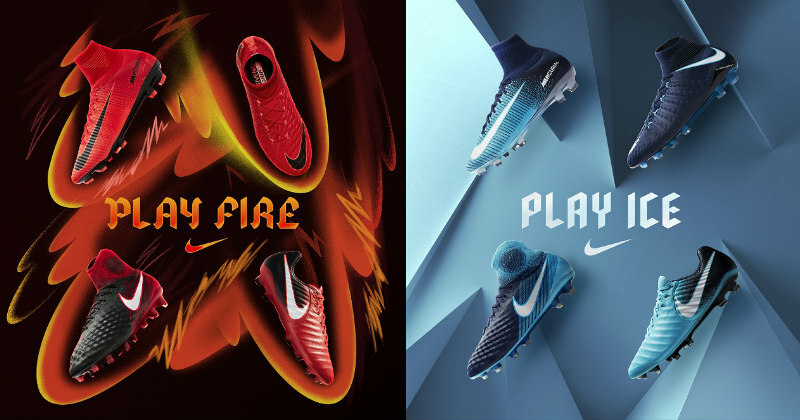 With their latest football boot collection, Nike are encouraging you to make that decision, and so only one question remains: are you going to play with fire in your heart or ice in your veins? 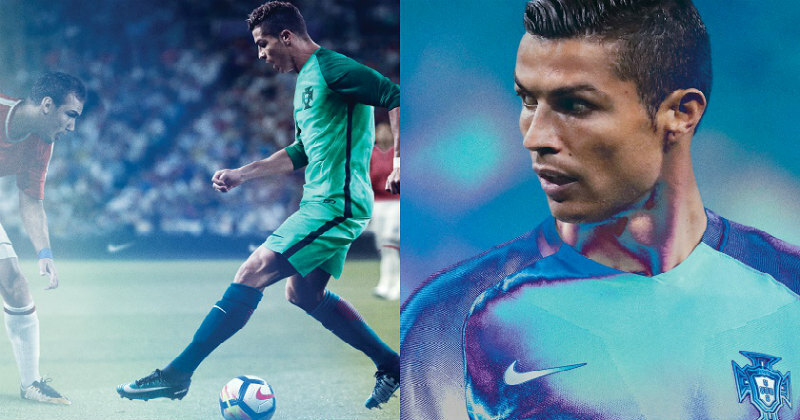 Officially unveiled today (October 30th) and hitting shelves around the globe November 6th, the Nike “Fire & Ice” collection asks you to pick a side and embrace the footballer you really are. 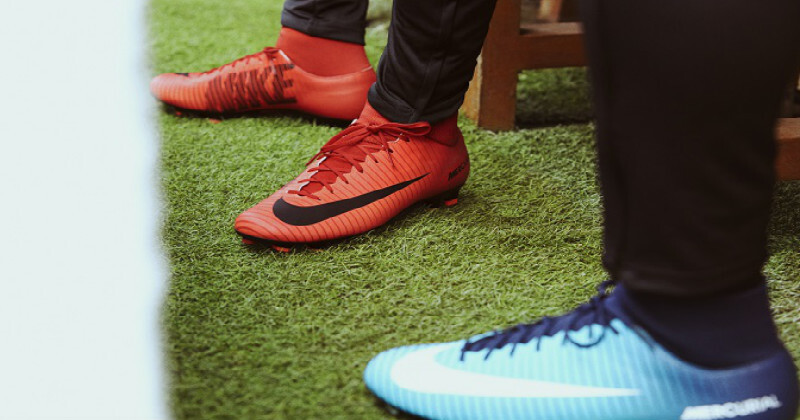 The collection has provided Nike’s four most popular silos with two brand-spanking makeovers each, with players having to choose between the fiery ‘Midnight Red’ and icy ‘Gamma Blue’ colourways. With the likes of Marcus Rashford, Phillipe Coutinho and Neymar looking set to join Team Fire- and Cristiano Ronaldo, Leroy Sane and Eden Hazard on Team Ice- players across the planet will need to make their minds up on which side they want to join up with. Basically, if the makers of Game of Thrones were to design a pair of football boots, they wouldn’t be too far off these bad-boys, and it goes without saying that they’re absolutely stunning. So let’s take a closer look at the new designs, shall we? 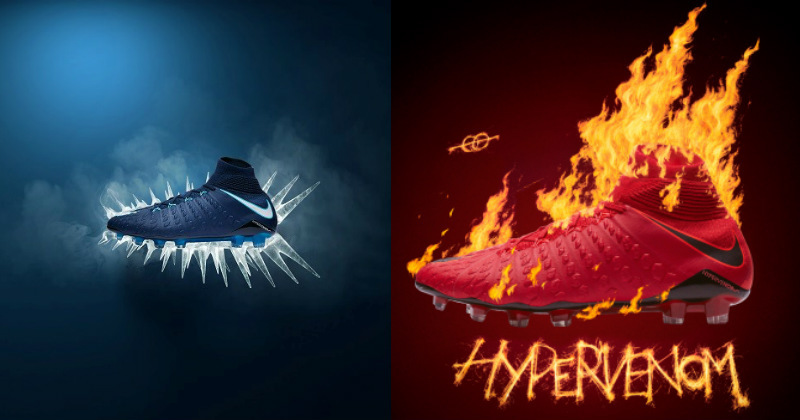 Whether you decide to PLAY ICE or PLAY FIRE, both of the new Nike Hypervenom designs are undeniably gorgeous. The fire option incorporates a dazzling red colourway that’s absolutely guaranteed to set pitches alight, featuring a ridged upper to provide an enhanced level of control. With the famous Swoosh standing out in a deep black colour, these fiery Hypervenom designs are bound to suit the more extravagant attackers on the field. As for the icy alternative, the dark blue colourway exudes style and finesse, and is the perfect design for any strikers that keep a cool head. Featuring the same innovative technology as the other Hypervenom releases of this year, these icy creations will send a chill down the spines of opposition goalkeepers, as you continue to slot the ball home with surgical precision. Designed to unleash explosive speed and leave defenders shattered in your wake, the Nike Mercurial boots are some of the most popular on the planet. Now that they’ve been given these gorgeous makeovers, we only expect that popularity to grow. 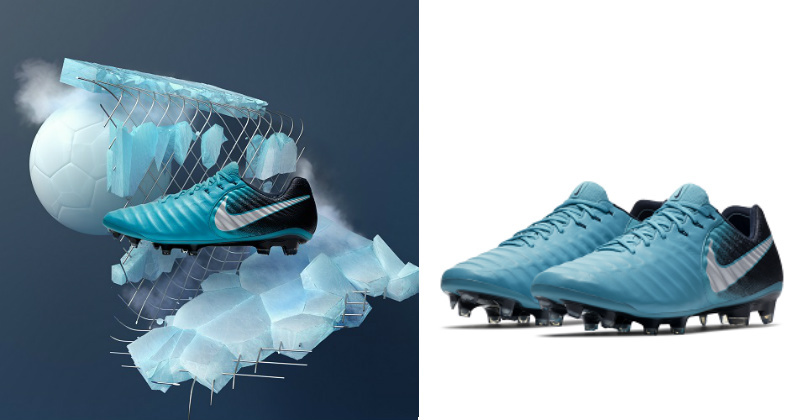 It seems as though Cristiano Ronaldo is going to take to the Bernabeu in a pair of these icy bad boys, as he looks to destroy defences and leave them frozen in their tracks this season. Featuring a beautiful light blue shade that gradually progresses into a much darker, almost navy, colour, the ‘PLAY ICE’ Nike Mercurial offers one of the most unique designs of this collection. The ‘PLAY FIRE’ design embraces the ‘University Red’ that is prominent throughout the collection, and combines it with a black Swoosh that travels right across the laces. With such a dazzling palette of fiery colour, you can practically see the flames emerging as you hit top speed in them. Using mind-boggling patterns, gorgeous colours and all-round slick design, the new Mercurial is an essential for any pacey wingers and forwards out there. Acting as a kind of reverse to the Mercurial design, the ‘PLAY FIRE’ Nike Magista football boots use the fiery tones a little more sparingly. Using a deep black as the prominent colour, and gradually implementing hints of red, it’s only the boots of the heel that share the fiery theme of the other boots in this collection. What results, though, is perhaps the smartest, most subdued entry in the collection, making it absolutely perfect for those players who don’t want the extravagance of the Mercurial or Hypervenom. That being said, the fiery black and red combination still doesn’t fail to catch the eye here. 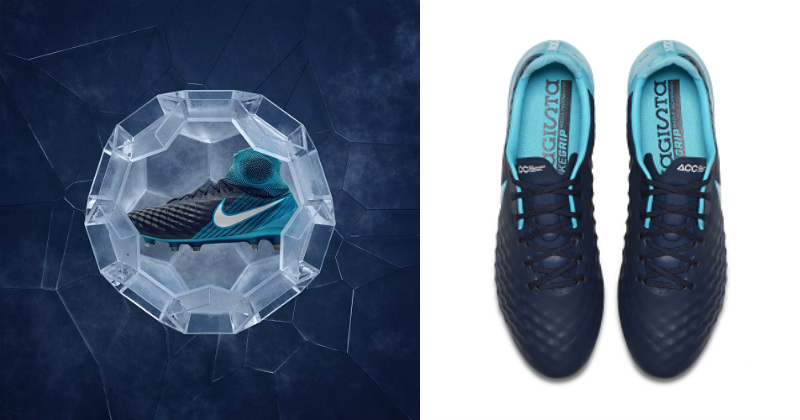 The ‘PLAY ICE’ Nike Magista is a complete replica of its fiery brother, but swaps out the black and red for shades of navy and light blue. 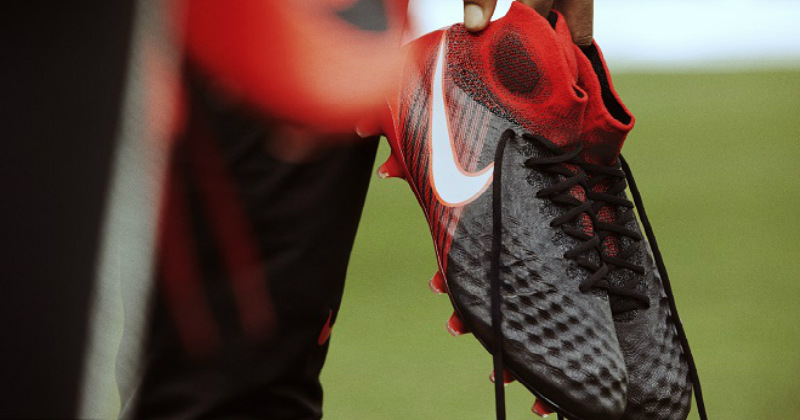 It goes without saying- any fans of the Magista have got one heck of a choice to make here. Ah, the Nike Tiempo- you’ve just got to love it, right? The icy version of these boots looks absolutely stunning, mixing a gorgeous light blue shade with black and white, and creating a truly frosty appearance. 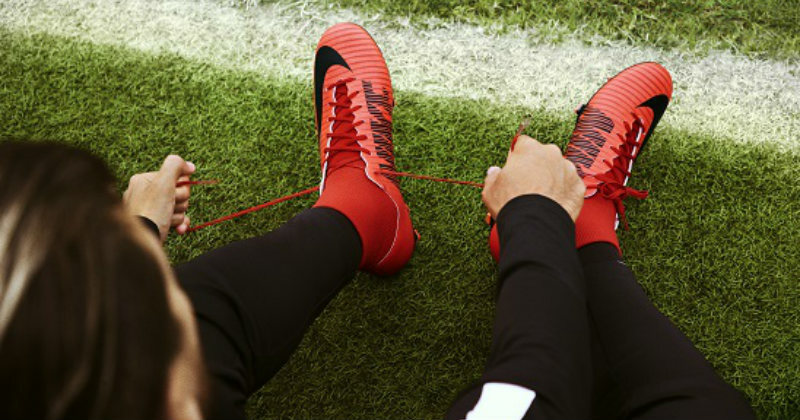 These vibrant tones will make absolutely anyone stand out on the pitch- regardless of whether you’re the main goal-scorer or even the goalkeeper- while the boots still feature the Flyknit technology that has become synonymous with the Tiempo silo. 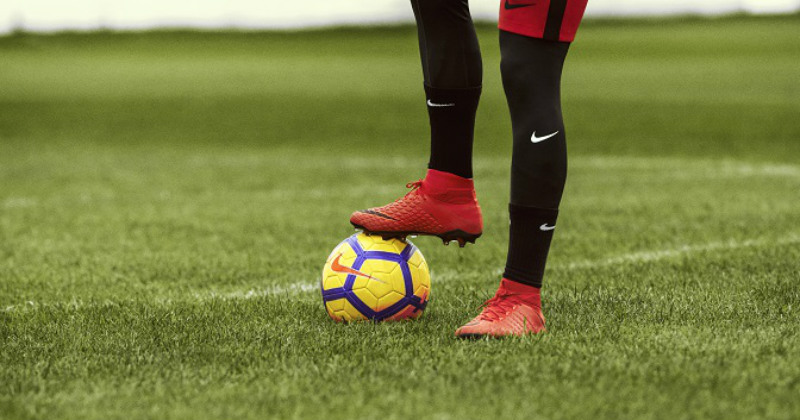 The ‘PLAY FIRE’ Nike Tiempo follows a very similar design, but this time makes use of the ‘Midnight Red’ shade as its primary colour, which gradually fades into black around the heel area. Featuring this eye-catching upper and Nike’s infamous boot tech, the Tiempo is just as beautiful is ever- and we absolutely love it. So which side are you going to be on: fire or ice? No matter what kind of player you want to be, you can rely on FOOTY.COM to find you the best deals on all kinds of football boots by comparing prices with the biggest online retailers!